This article references a Dr. Funkenstein. Anybody with that name should play base for George Clinton. In the spring of 1943 a Swiss chemist, Albert Hofmann, while working with a chemical in his laboratory one day, was overcome by peculiar mental sensations. He became restless, felt disembodied, could not concentrate on his work. Fantastic images of extraordinary plasticity and kaleidoscopic coloring flitted through his mind. In a dreamlike state, he left the laboratory and went home. Correctly connecting his disturbance with the chemical he had been preparing, Hofmann conscientiously recorded every sensation. His description was the beginning of a remarkable series of discoveries. The chemical that so affected Hofmann was a derivative from ergot, a fungus that grows on rye. The derivative is called d-lysergic acid diethylamide tartrate, or LSD for short. Hofmann’s account indicated that the drug first acted on the autonomic nervous system and then produced psychotic symptoms. The discovery was intensely interesting to psychiatrists. Not only did it show a definite link between a physiological disturbance and mental changes, but it suggested that here at last was a drug of which investigators of mental illness had long dreamed: a drug which would produce experimental psychoses for study in the laboratory. Since 1949 we have been studying the effects of LSD at the Boston Psychopathic Hospital. The research began with no elaborate plan, but after some preliminary observations we undertook a systematic investigation of the reactions of various types of subjects under various conditions, together with certain physiological and biochemical studies. So far we have examined the responses of more than 100 healthy volunteers and a number of psychotic patients. The studies led to a new chemical concept of psychosis. 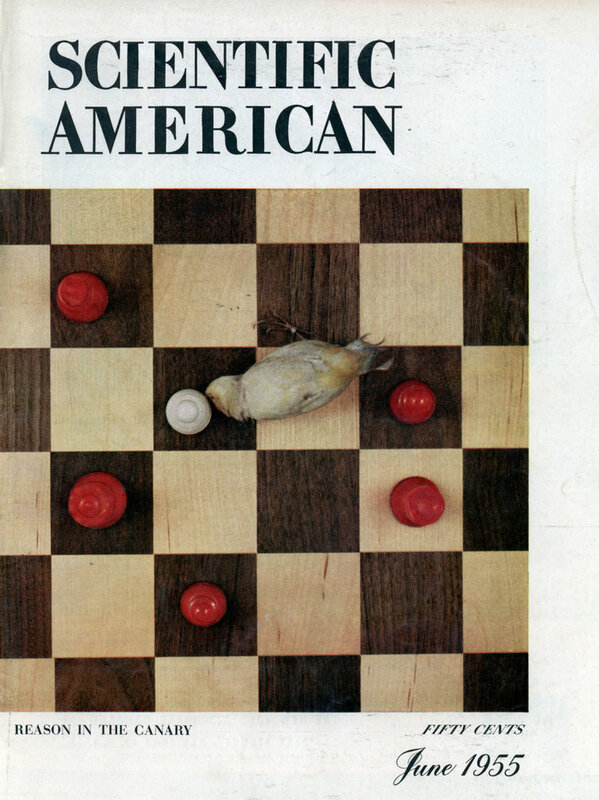 Our observations tie in strikingly with the findings of Daniel H. Funkenstein at our hospital concerning the roles of adrenalin and nor-adrenalin in the emotions [see “The Physiology of Fear and Anger,” by Daniel H. Funkenstein; Scientific American, May]. Dr. Funkenstein has shown convincingly that people who repress their anger liberate an abundance of the adrenalin-type substance and become depressed, while those who act out their anger release more nor-adrenalin. Our experiments showed that LSD affects mainly the adrenalin system. One interesting case was that of a lobotomized patient. When she was given LSD, she reverted to her pre-lobotomy depression. As the effects of the drug wore off, her agitation and depression subsided and she recovered the marked improvement she had shown after her operation. 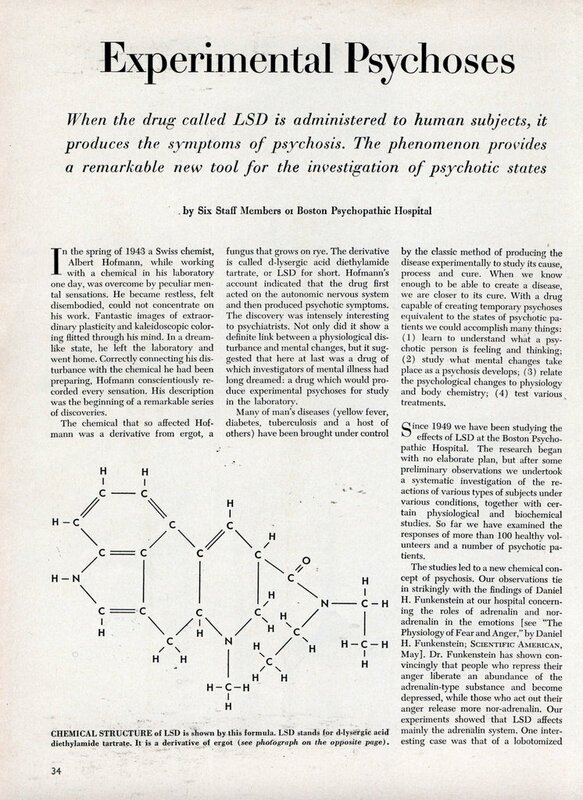 Other studies related the psychotic state to the complementary functioning of the pituitary and adrenal glands, commonly thought of as the “pituitary-adrenal axis.” Hudson Hoagland and Gregory Pincus at the Worcester Foundation for Experimental Biology demonstrated that LSD reduces the output of inorganic phosphates in the urineâ€”a situation usually characteristic of schizo-phrenicsâ€”while the pituitary hormone ACTH increases this output. In the experiments with normal subjects, a standard dose of LSD was given and the subject’s reactions were carefully recorded for a number of hours, both by the person under the influence of the drug and by observers. On the average the major effects last for six hours. Within an hour after taking the drug, the subject shows a number of physical symptomsâ€”restlessness, tremor, weakness, sweating, sensations of heat and cold. These persist without much change throughout the six hours, but the mental effects progress through a series of different stages. At first the subject has feelings of irritation, hostility, anxiety and apprehension, such as any normal person may experience under stress. In the second hour he begins to lose touch with reality and show psychotic symptoms. The subject withdraws into himself and is overcome by apathy, lethargy and confusion. He feels that something strange has happened, that things seem different. He may have the sensation that he does not exist or that parts of his body have altered form; one subject felt that there was nothing between his hip and his foot, although he knew perfectly well that his thigh and leg were intact. All sorts of visual illusions appear, and the subject commonly has the illusion of a metallic taste in his mouth. His thoughts slow down. He becomes more or less inarticulate, apparently because he cannot put into words the unfamiliar ideas and strange sensations he is experiencing. He may smile at inappropriate times; occasionally a subject laughs against his will. Often there is a peculiar change in the sense of time: though the subject may know quite well the date and time of day, it seems to lose its meaning, and he may feel himself “out of time.” During the period of unreality the subject may experience a recognizable mood, such as depression, elation, anxiety or anger, but even this emotion has a vacuous quality. In the fourth hour after the drug was taken, the psychotic symptoms begin to decline rapidly. In the sixth hour the early symptoms of irritation, hostility and anxiety return. Then the effects of the drug subside and by the tenth to the twentieth hour the subject becomes completely normal again. We tested the changes of personality of a number of LSD-drugged subjects with the Rorschach, Draw-a-Per-son, Thematic Apperception and Wechsler-Bellevue tests. Of 29 subjects so tested, all but two changed significantly in at least one major area of personality, such as perception, cognition or emotion. The drug usually impaired the ability to concentrate and to make complex associations and abstractions. It narrowed the subject’s perceptual field to those parts of the environment close to him. It reduced the capacity to organize and interpret experience and diminished concern about the past and future; the subject focused primarily on the immediate situation. He lost his usual discrimination between himself and others: he frequently attributed his own feelings to other persons or to physical objects. Sometimes he acquired an unusual insight into his own and other people’s underlying attitudes. To help the subjects express the feelings they had experienced under the drug, which they found so difficult to communicate, we asked them to draw pictures afterward. These pictures vary considerably in the feeling tone expressed. One clearly evokes sadness and dejection; another, warmth and togetherness with people; still another, confusion. New subjects shown these pictures usually found them helpful in clarifying their feelings and verbalizing their experiences. From the social point of view, the LSD experiments serve two purposes. Firstly, they make it possible to study experimentally the effects of the psychotic state on social behavior. Secondly, they afford a means of comparing the reactions of people of different social status or in different social situations. The experiments have emphasized the importance of social and cultural factors in mental illness. For instance, the drug caused more severe disturbances of social behavior in younger people and those with less formal schooling than in those who were older or had more education. Another comparison was made between two groups of volunteers, one consisting of workers in the hospital, the other of outsiders. The hospital staff members showed more response to the drug, were able to describe their symptoms better and carried a more lasting memory of the experience. One reason was that they entered into the experience more willingly because they wished to learn the feelings of psychotic patients; another was that they were in their usual environment and were more conscious of the departures from their normal behavior in that setting. They were under greater stress than volunteers who merely came into the hospital for an experiment. The drug-induced experimental psychosis generally changed the subjects’ social behavior in a marked fashion. They tended to withdraw from other people, to express hostility and to seek support and reassurance. The intensity of their symptoms varied with the stress under which they were placed. When they were questioned, examined or given work tasks, without any compensating social support, their symptoms became more severe. When a subject encountered a person who seemed hostile or too inquisitive, he perceived a change in the person’s appearance, creating an unfavorable caricature. On the other hand, when the other person was very friendly, the subject distorted him in an excessively favorable light. The subject was least likely to see the other person as a caricature when the other person was understanding or gave him emotional support. When subjects received the drug in a group, there was a great deal of joking and laughing among themâ€”often seemingly meaningless. Even subjects depressed by the drug joined in this apparent hilarity, as if involuntarily. Anxiety, distortions of people and inappropriate behavior decreased significantly. Yet all these subjects had just as severe feelings of unreality and confusion as those who received the drug alone. Evidently group participation relieved the tension. Subjects also showed a decrease in symptoms when attempts were made to aid them, either informally or by planned psychotherapy. The creation of experimental psy-choses with lysergic acid thus opens the way to studying treatments and the nature of mental illness. We can see the various defenses a subject brings into use, one after another, to protect himself from stressful experiences. We can relate the defense mechanisms to the individual’s basic personality structure, as determined before the experiment. We can see the similarities of these defenses to those commonly exhibited by psychotic patients, especially schizophrenics. We can detect stressful situations of which hospital staffs have not previously been aware. And we can determine what treatments and what experiences give the most support to a patient and are most effective in reducing his symptoms. Among other things, the experimental psychosis offers a means of testing the effectiveness and studying the action of therapeutic drugs such as the new chlorpromazine and reserpine. For the first time we can investigate experimentally the many relationships between the psychotic state and the body’s chemistry and physiology. Most important, however, is the insight that lysergic acid gives into the mind and feelings of a person afflicted by mental illness. We can telescope a severe psychotic reaction into a period of six to 12 hours and follow the emotional disintegration step by step. The staffs of mental hospitals have struggled year by year to get a deeper understanding of what their patients are actually feeling and thinking. Only in this way can they come into communication with the patient and help him. Now that they can experience themselves something approaching the feelings of their patients, they will be able to communicate better. Moreover, mental illness will no longer be so strange or mysterious; there will be fewer barriers between the sick and the well. Thus the lysergic acid experiments have greatly broadened our approach to mental illness. They also highlight the advantages of team research combining many disciplines. In this project physiologists, psychologists, clinical psychiatrists and sociologists are all working together on the great problem of mental health. i have recently been diagnosed with psychotic depression. according to what i’ve read, i’ve always had it, but drug use(marijuana) triggered and exacerbates the symptoms. i’m currently on antipsychotics and antidepressants to treat it. the paranoid symtoms and most of the anxiety is gone, but i still experience mild psychotic symptoms (sounds, things in my peripheral, irrational fears rarely). if it would help find a way to make this illness go away for good, i would be interested in helping. A short, enlightening article worth reading. I’ve used LSD a couple of times and know firsthand how powerful it is. This is why I don’t understand why we’re firing people for smoking pot but we’re not even bothering to test for acid. Go figure. I find this article a bit laughable in the way that it categorizes very specifically the effects of people under LSD. I have never experienced half of the reactions that are described; the most ridiculous of which is the assertion that while on acid you experience an inability to articulate what is going on around you and in your mind. With this to consider, I’m not exactly sure if LSD can be used in the way that the article suggests unless the subject experiences a bad trip, during which temporary insanity does set in.